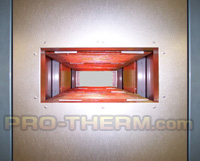 PROTHERM, LLC offers energy efficient electric infrared tunnel and clam shell ovens. This style of oven is similar to web dryers in that the product is normally spool to spool or continuously run unsupported through the oven. Some applications include heat shrinking, curing and drying for inks and coatings on wire, cable, and tubing; preheating composite lumber prior to embossing; post heat extrusions/pultrusions, and curing paint on sheet metal coils. Tunnel and clam shell ovens are custom built with removable side panels or hinged housings for easy product threading and maintenance. PROTHERM, LLC ovens are designed to be installed quickly, with a minimum of field wiring or preparation required. They are completely factory assembled, set up and tested prior to shipment to assure a simple trouble free start up. 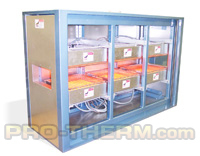 For the oven heat source, PROTHERM, LLC offers a variety of electric infrared heaters, each with their own heating advantages and unique characteristics. 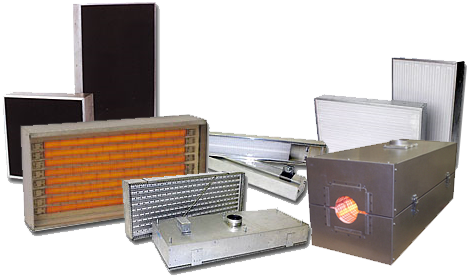 All heaters are completely manufactured at Protherm, LLC, assuring you the highest quality, proper use, and best support. Our popular series Infraround heater is often used for clam shell configurations. The electric IR heaters are proven to be highly efficient and environmentally friendly to save you energy dollars and eliminate hazard and emission issues. A reliable custom control panel can be supplied for the oven with precise solid state controllers, sensors, as required for a stand alone or integrated system. We can also build custom stands, rollers, or attachments to help support your products.